The first performance results of the GeForce GTX 1070 graphics card have been leaked by Videocardz. The new results show that the GeForce GTX 1070 is not only much faster than the GeForce GTX 970, but also beats Titan X and GTX 980 Ti reference solutions in synthetic benchmarks. 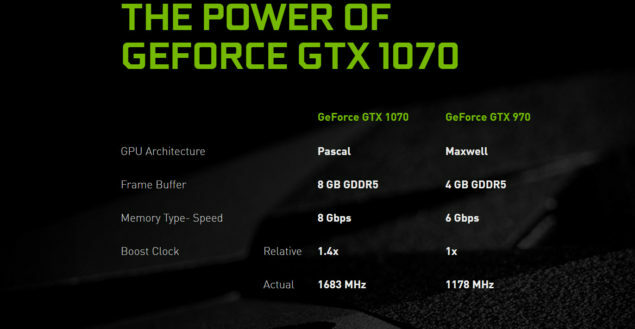 The GeForce GTX 1070 is one of the two graphics cards that features NVIDIA’s Pascal GP104 GPU architecture which is aimed at gamers with better performance per watt. The NVIDIA GeForce GTX 1070 is the most competitive GeForce 10 series graphics card. 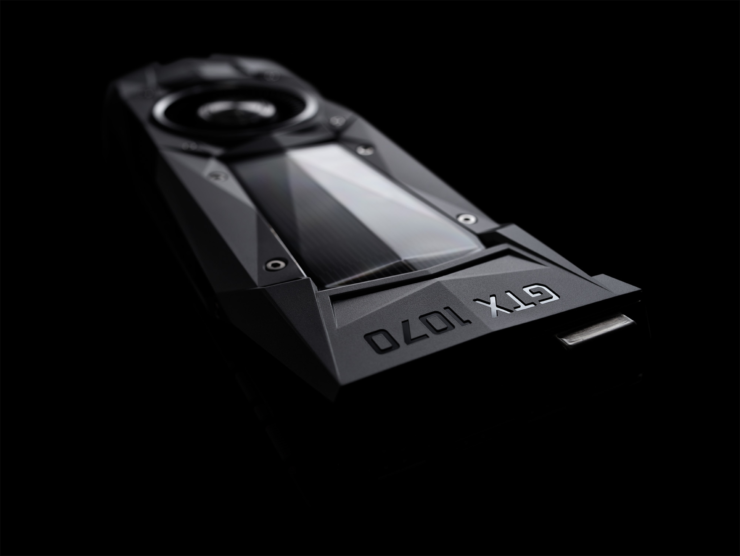 The GeForce GTX 980 Ti and Titan X will look like poor options for gamers after the GeForce GTX 1070 launches. Not only will the GeForce GTX 1070 be faster than both GM200 based cards, but will also be better at efficiency and overclocking. NVIDIA GeForce GTX 1070 custom solutions will also be available on launch which will deliver better performance and start at MSRP of $379 US. Current users of 980 Ti and Titan X class graphics card won’t feel the need to upgrade their graphics cards to GTX 1070 but buyers who are searching for a new graphics card in the market in this price range would definitely want a GTX 1070 in their PCs. The GeForce GTX 1070 also replaces the GTX 970 which is one of NVIDIA’s most successful graphics card from last year. Topping the steam charts as the most popular desktop PC graphics card, the GeForce GTX 970 was a big success for NVIDIA. 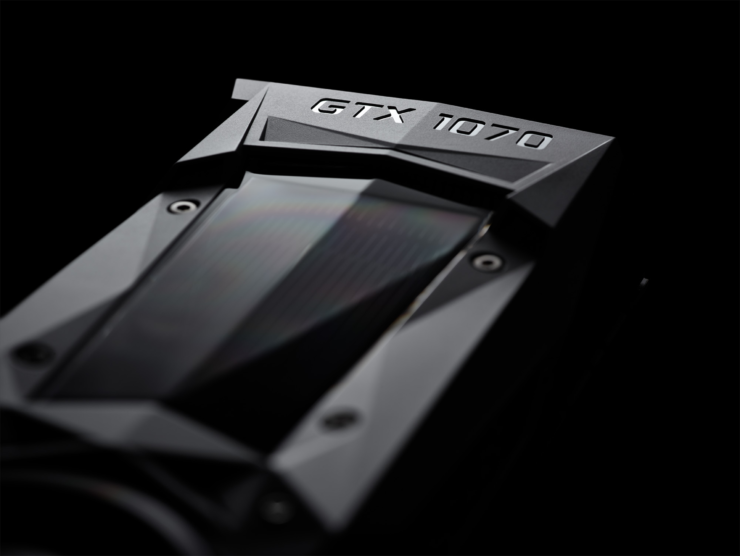 The GeForce GTX 1070 would keep the legacy of its predecessor alive with the same approach of being a faster graphics card at a competitive pricing and much better efficiency. The numbers that are shown below would give you an early indication of what to expect when you upgrade from a GTX 970 to a GTX 1070 graphics card. 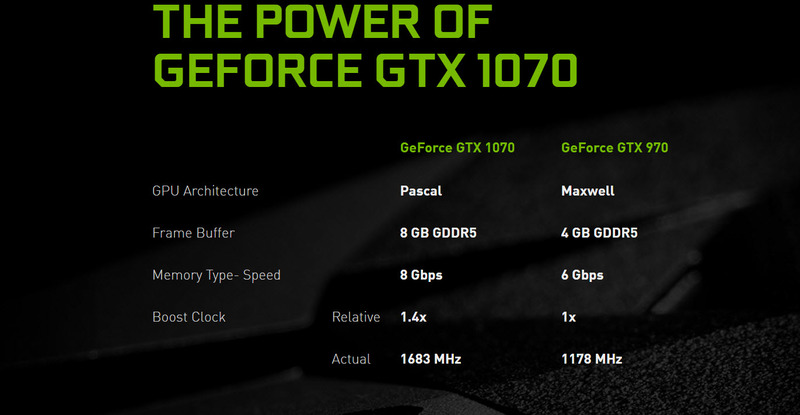 The NVIDIA GeForce GTX 1070 features the GP104 GPU (GP104-200-A1) core which comprises of 1920 CUDA cores. NVIDIA’s FinFET architecture allows significant increase in clock frequency increase. The GeForce GTX 1070 is clocked at 1506 MHz base anad 1683 MHz boost clock. The GTX 1070 would feature the same potential of overclocking as the GTX 1080 (or better) since it has more TDP headroom compared to its bigger brother. In the case of 1070, we are looking at a 150W TDP compared to 180W on the GTX 1080. 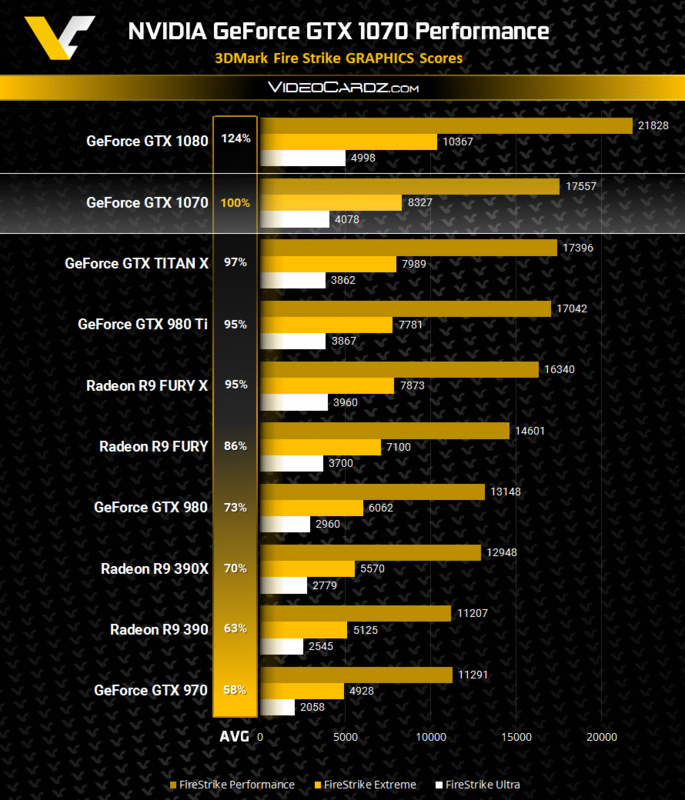 NVIDIA Pascal GTX 1070 is better than the GTX 970 in all possible ways! The chip features 8 GB of GDDR5 memory featured across a 256-bit bus and clocked at 8 GB/s. This leads to a total bandwidth of 256 GB/s. The reason for using GDDR5 memory is to offer a more competitive variant that doesn’t skims down on VRAM while keeping the price relatively low. 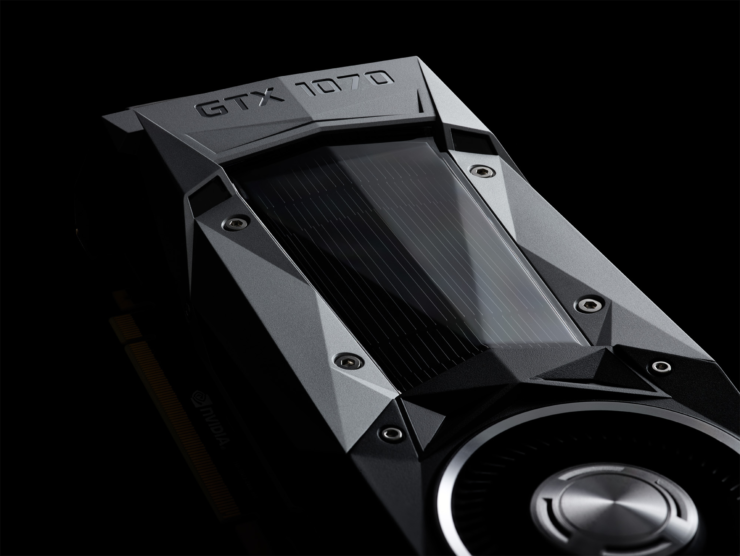 NVIDIA GeForce GTX 1070 has better gaming and VR performance than the GeForce GTX 970. A must have for gamers! The NVIDIA GeForce GTX 1070 features just 150W TDP. Coupled with a very smooth power delivery system to avoid leakage, the chip is one of the most efficient GPU architecture ever designed for gamers. The display out puts for the card include Display Port 1.4 (4K @ 120 Hz), HDMI 2.0b (4K @ 60 Hz) and DL-DVI which means that it is capable to support all next-gen displays with new standards. Power is fed through a single 8-Pin PCIe power connector. The performance results of the GeForce GTX 1070 come straight from Videocardz and as seen below, the card beats the GeForce GTX Titan X and GeForce GTX 980 Ti by 5%. While this is not a big difference, drivers for the card is still in t he process of development so we expect to slightly better performance in the final reviews. One other thing that should also be pointed is that the GTX 980 Ti compared is a reference solution so overclocked variants will have no problem closing the gap and even being faster than the GTX 1070 which is why Titan X or 980 Ti owners should wait either get the GTX 1080 (Custom Models) or wait for the big Pascal GPU. For GTX 980 and GTX 970 owners, the GeForce GTX 1070 is an easy 30-45% increase in performance which is a good figure, especially when this card will be available at a starting price of $379 US. The card is almost half the cost of 980 Ti with better performance at its original MSRP. Compared to the GTX 1080 Founders Edition, it is even better value however the GTX 1080 is around 24% better at a higher cost. The GeForce GTX 1070 clocked in around 1860-1870 MHz boost clocks without any overclocking. Pascal being much efficient can allow better clocks with available voltage and TDP headroom. The new 8 GB/s chips on the GeForce GTX 1070 can easily overclock beyond 9 GHz effectively increasing the bandwidth up to 288 GB/s that is quite good. 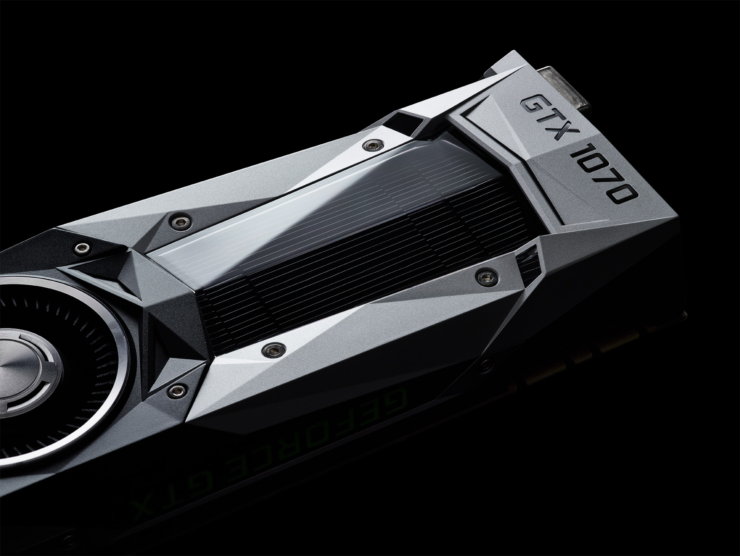 The NVIDIA GeForce GTX 1070 would launch on 10th June while the GeForce GTX 1080 launches on 27th May.